Info "Save me from the building! Like all plants, the beanstalk grows in the direction of the sun." Wario and the Beanstalk is one of Wario-Man's microgames in WarioWare: Twisted! The name is a pun on the fairy tale Jack and the Beanstalk. 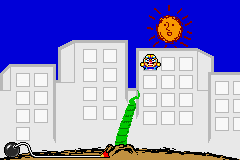 The player must save Wario from the building with a beanstalk. To do so, he or she must tilt the Game Boy Advance to move the sun, that attracts the beanstalk. Level 1 - The beanstalk grows quickly. Level 2 - The beanstalk grows slowly. Level 3 - The beanstalk grows slowly and two Warios need to be saved. This page was last edited on November 17, 2018, at 03:33.